The Gnu Velvet (formerly Velvet Gnuru) has a C2 BTX camber profile that has an easy to ride catch-free feel. It’s not a bad choice for an all mountain freestyle rider on a budget. The 2019 Gnu Velvet model we tried did have an upgrade to C2 so disregard our discussion about the camber profile. Conditions: Hard Snow in some places, to ok snow in others. This is more like the Never Summer Rocker/Camber. 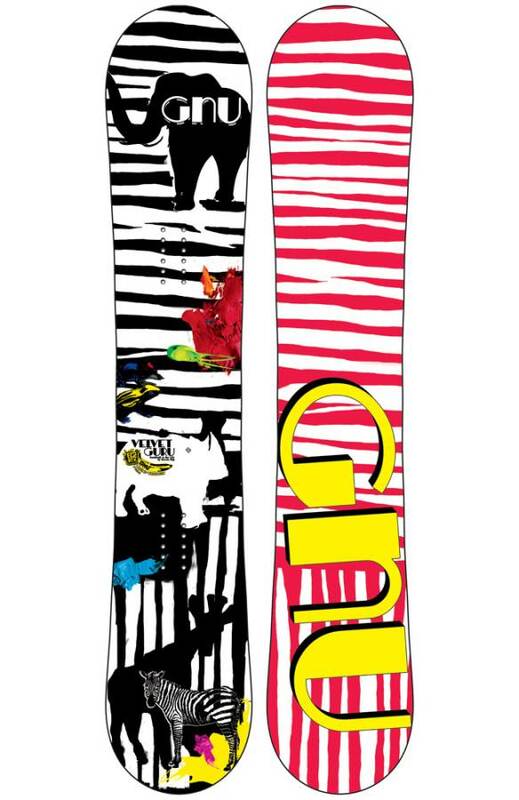 This provides a more loose ride but still allows your tail to grip the snow when in a carve. On Snow Feel: Big surprise here. We thought the Gnu Velvet Guru would be a more loose and playful freestyle focused kind of feel that is in between BTX and C2 BTX but it’s not at all. It’s actually more stable between the feet than many C2 BTX shapes. It’s pretty easy to one foot and flat base. This isn’t a bad all mountain freestyle board for the price and offers more stability between the feet than most hybrid rocker boards out there. It can ride the mountain almost like an all mountain board but it can also ride the mountain like an all mountain freestyle board. Powder: You can tell by the rocker that this will plane well. When it gets deep it will be tough like all twins are. You will have to be a good snowboarder to keep it planing above the powder. Speed: The Gnu Velvet Guru has a base that isn’t super fast but still does a good job keeping the board moving forward and it’s predictable. As speed picks up the flex remains stable and holds pretty well for a hybrid rocker board. Uneven Terrain: The Velvet Guru gives a decent shield between your feet and crappy snow. Edge Hold: The Edges seemed to be in good condition and so we think this is how the board rides but we can’t say for sure. 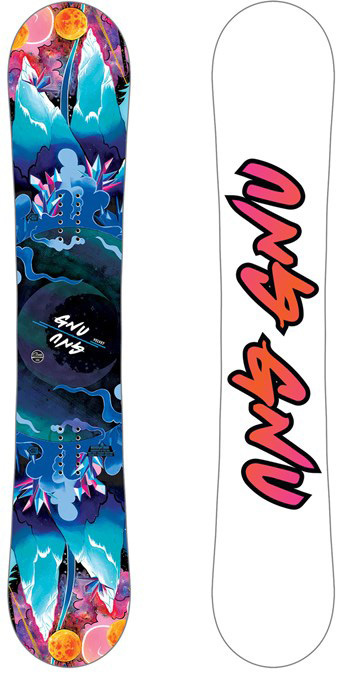 The Gnu Velvet Guru seems to have one of the most mellow MTX side cuts of any board out there. This makes it a far better good conditions board than the more aggressive magnetraction boards. If you ride in anything from snowment to packed powder you will have a good time. If you ride in ice you might like something like the Lady’s choice or TRS Slim. Flex: Closer to the softer side of medium. It did not press or butter anywhere close to the Ladies Pickle. It seemed to have the same flex throughout the entire board. Rails/Jibbing: Fun in the jib park but it feels a little better in the jumps and pipe. Pipe: This is a pretty good pipe board. The Lady TRS is better but it’s not bad at all. Jumps: The Gnu Velvet Guru is not super poppy but it can spring with moderate effort. Hitting small to medium kickers is great with this board. We try to get as many images of the Gnu Velvet, but forgive us if they're not all there.